Global temperature anomalies fell back to 0.19C in August. This means the YTD average is 0.23C, putting them back to roughly where they were in 2002. Somehow, I don’t see armageddon! Let’s see. Sailboats getting stuck in the Arctic while trying to sail though the ice free waters caused by global warming. Probably those of that ilk with more southerly views are planning their summer voyages to the Antarctic to view the devastation from global warming. Thus, they will get larger vessels stuck in the surely non-existent ice and cry out pitifully for rescue. Typical year. Nothing to see here. It has not been an easy year in the Northwest passage. At least one boat turned back on the Pacific side, at least eight on the Atlantic side, one yacht crushed and sunk with two men rescued after standing eleven hours on the ice, and ninety teachers and students helicoptered off a big ship that struck a rock when moving south of the ice. The whole theory of the “Death Spiral” is based on ever-decreasing ice. Open water is suppose to lead to warmer water which leads to less ice. For the ice to increase in any way, or merely to stay the same, refutes the theory. It is not a spiral. It is a cycle. Both recent and not-so-recent history leads to the same conclusion. Paul you are clearly not reading “The Graunard”, or listening to the BBC, or you would know better. 500 GT of water is a quantity I don’t relate to. 500 GT is about 368 million acre-feet. 1 Lake Erie or 3 Lake Tahoes. Reality is just a series of aberrations to be exploited if convenient, otherwise it’s the climate models that matter in alarm-land. They have to do more and more acrobatics to make their case. Meanwhile in places like Australia and Canada people are saying enough of raising energy bills for the bogus wind and solar which can’t produce power worth the cost that goes into them. According to NOAA (a reliable source?) The global mean temperature with respect to 2017 has declined consecutively for every month in 2018 through July. The seven month average, minus 0.14°C. 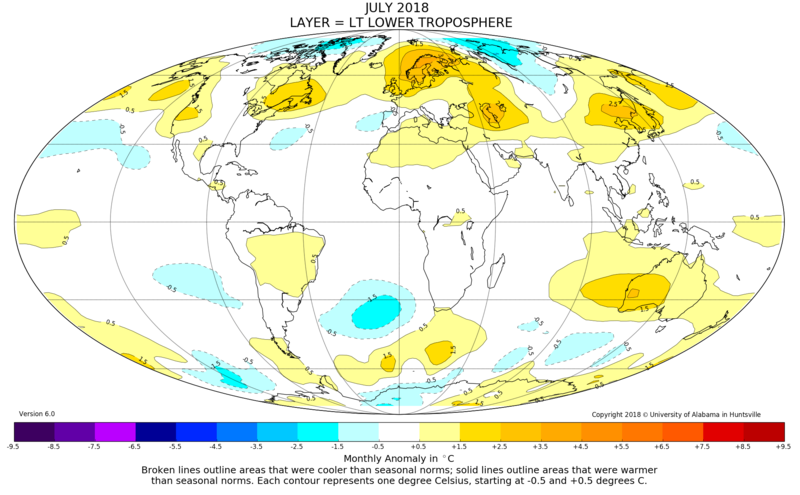 According to UAH, the northern hemisphere temperature anomaly is the lowest it has been since before 2017. I can’t wait for Harrabin to report this. Never have so many been conned by so few for so much. It is very hard to see why some people can not see what is really going on. It has nothing to do with climate. The great socialist train has been heading at us for decades but with luck may be finally running out of puff. Thus people of all political persuasions have been able to take something positive from the climate change agenda. Unfortunately, it has all had to be paid for by energy consumers – and nobody has been looking after their needs for cheap, reliable energy! 1. Dieter Helm, “The Carbon Crunch”, Yale, revised and updated paperback edition, 2015. I am posting this again because the first posting seems to have got lost. I think that is a very good point to make. Most “warmists” concentrate entirely on the above normal areas, while ignoring the below ones. They can only see the above normal areas. But the warm and cool areas, more or less balance each other out, with most of the globe within normal limits. The above normal areas are above normal BECAUSE some others are below normal. The globe is never a uniform temperature. The important fact is the difference which in the case of UAH is 0.19c, which on a global scale is miniscule. To the extent that other temperature data sets give a higher figure, is in part due to the incomplete nature of the data. The fact that “warmists” can’t see this, demonstrates their bias, and makes them what they are. The global charts always interest me as the areas that are “average” are usually very few. It seems that above or below is actually the norm! Esoterica. 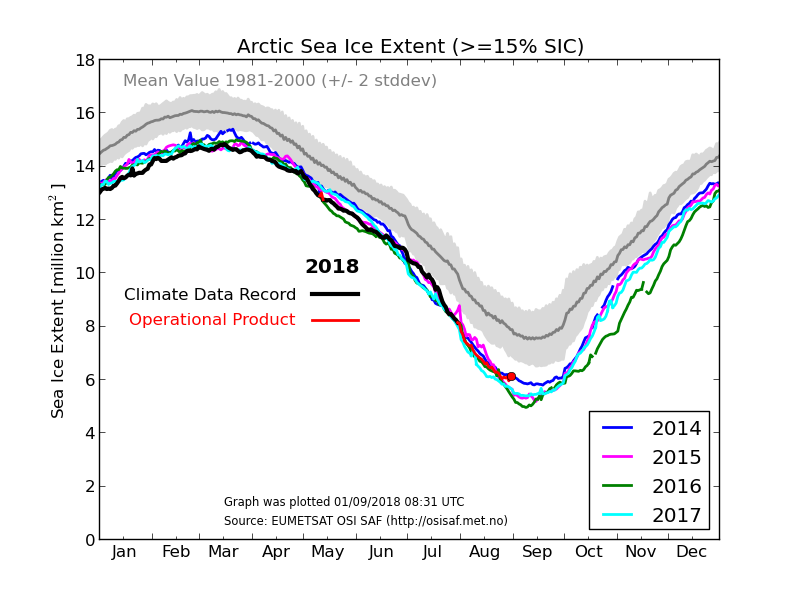 Arctic sea ice goes up; Arctic sea ice goes down. It affects virtually NO ONE what the ice does. No one would even know if it weren’t for government agencies telling us. It means NOTHING. 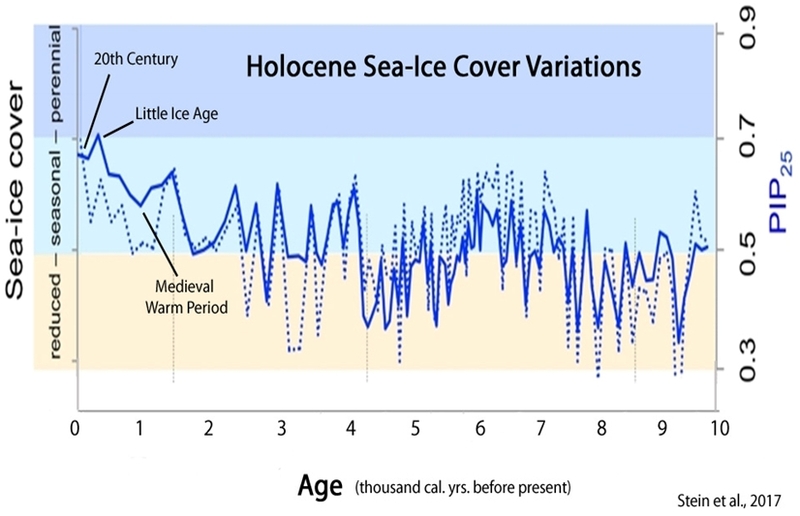 Arctic Ice cycles on a 60-70 year period. The satellite record is still well short of this and subject to some sensor calibration issues. There is great fanfair about a new satellite to record more in depth data but the record for that only starts when it begins operation, so call back in 60-70 years to see a comparison. Stephanie, an objective voice from a university- it’s not something we hear very much. Only areas that have melted can freeze. The more melts, the more freezes. So the world surface temperature at head height is 0.1C warmer than the 30 year average starting from the cold period c.1979. And we are supposed to be alarmed????? Amidst all of the hottest evah claims, a dose of reality from UAH. I mean the embedded little chart, on the lower right of the page, showing August monthly anomalies, year by year. If one clicks on the chart, there is enlargement. So it would seem that the minimum for this year is probably now in place as a statistic, and it is 4, 474, 500 sq km. This compares to the minimum, in 2012, of 3, 368, 682 sq km. 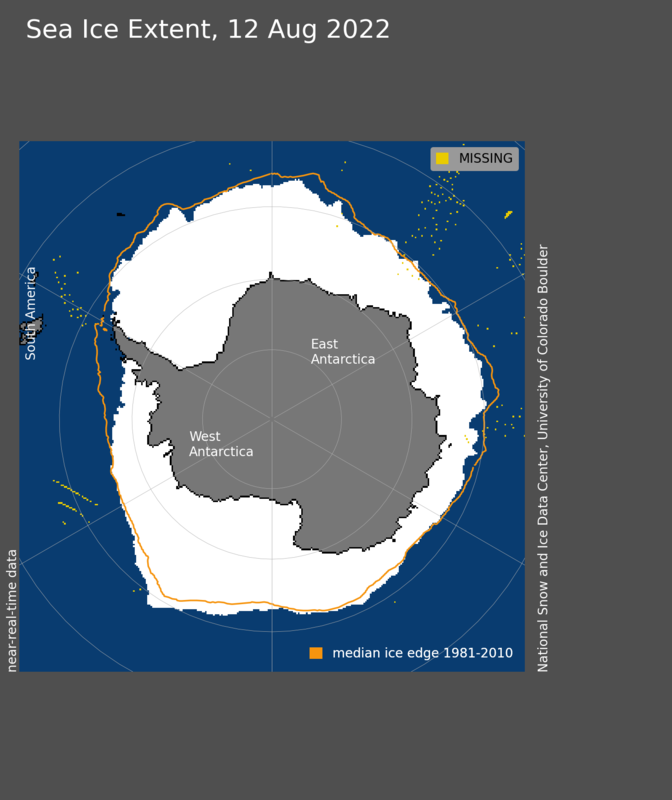 Six years of expansion of the ice, while global warming is “rapidly worsening”? Pull the other one! Much as I would like to agree, I think we need to wait a fortnight or so. Weather can have a large effect on sea ice at this time of year. If you look at other years, they bounce around quite a bit as well. On the above chart, I think that most of the map is white or very pale. IMHO it not the amount of “normal” temperature which is important, but the balance between high and low. It is biased to concentrate on the high, while ignoring the low. The Southern Hemisphere is naturally less variable*. Therefore, this is the half of the Globe to watch. *Because of the amount of Ocean. 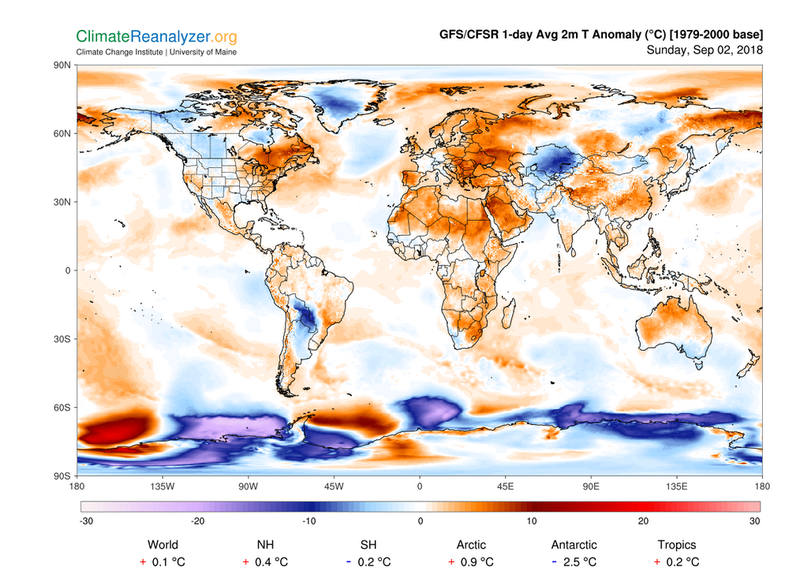 And global temperature anomaly dropped to +0.19ºC in UAH for August. 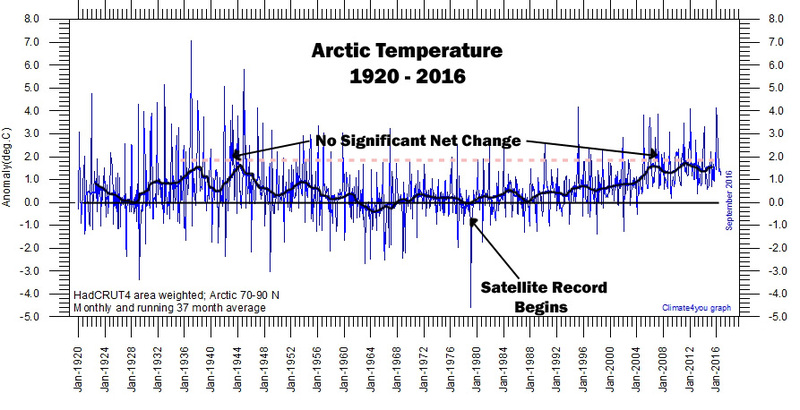 Mr. Homewood: The graph displays average global temperature anomalies, not average temperatures. 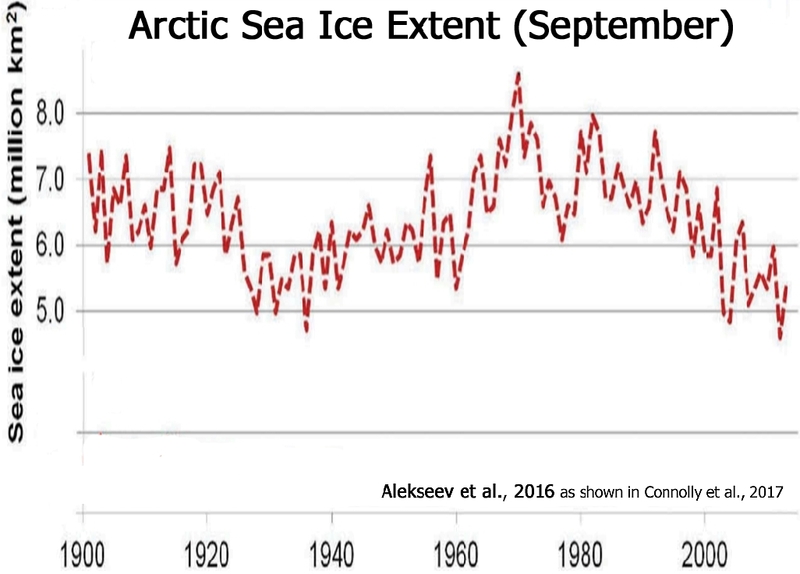 I use references to your data all the time but help me understand the arctic ice data chart. It shows the last 5 years are all below the avg. from ‘80 to ‘00 ( below the 2 sigma point). Am I reading that correctly? If so, doesn’t that say that we have less ice now compared to that earlier period? 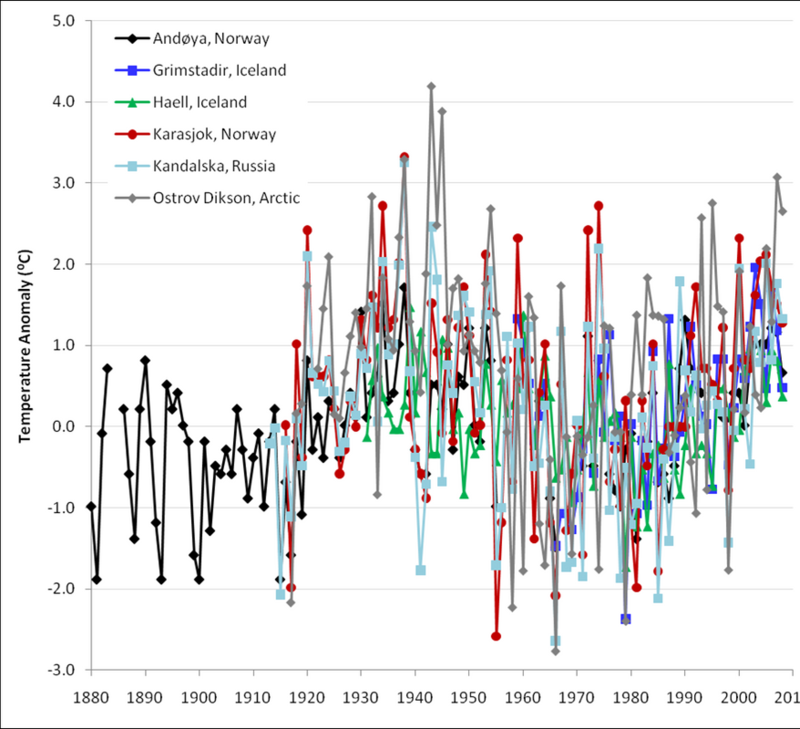 Yes, there is less ice than in the 1980s, which was an excpetionally cold period in the Arctic. I learn more from the comments here than I do the articles! It is heartening to know there are rational level-headed people out there. Thank you all for fighting the good fight. And keep up the good work.